Accurately segment registered customers and guest visitors by orders, shipping addresses, shopping cart data and many other parameters. Use flexible rule conditions to create customer segments and automatically update segmentation lists by cron. With the Magento 2 Customer Segmentation extension you will be able to sort customers by various criteria like date of birth, payment and shipping methods, sales amount, products added to cart and many others. Create flexible segmentation rules to arrange registered clients and guest visitors in groups and run highly targeted marketing campaigns. Customer email and many others. Flexible settings let you specify customer attributes that should be available in rule conditions. Due to this option you can easily include/exclude any attributes to make rule creation fast and easy. Once a segmentation rule is created, the Magento 2 visitor segmentation module automatically generates the customers list according to rule conditions. 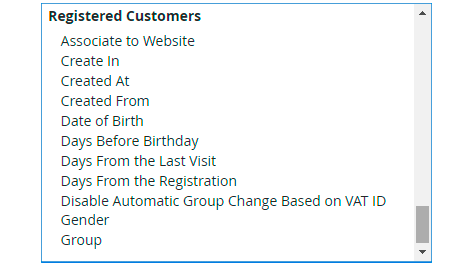 All customer data is displayed on a separate grid right below the rule. The number of items added to cart. Use the re-indexaction option to timely update customer segments. By default re-indexation is run by cron according to your schedule, but you can also reindex segmentation lists in bulk manually at any time. Easily export any generated segmentation list to XML or CSV files for further processing. Create flexible rules based on multiple order parameters. E.g. Segment customers who purchased products with specified attributes amounting to a particular sum. Segment registered and unauthorized customers by their shipping and billing addresses to create a rich database by country or city and target your campaigns depending on a customer location. To create complex segmentation rules use various condition combinations. Easily combine order, cart and customer data to launch effective direct marketing campaigns. Sort registered clients by the number of viewed products as well as the number of products, added to wishlists. Apart from that, these rule types let you specify any additional product attribute for proper segmentation. Manage all cron tasks on a Cron Tasks List grid in the backend. Delete tasks in bulk, use filtering and sorting options when it is needed. Compatibility with Order Attributes and Customer Attributes extensions: select custom attributes for segmentation. Use Customer Segmentation tool together with the Follow Up Email extension to launch highly targeted email campaigns. A good extension even if you are new to segmentation and all this customer-oriented stuff. It is not that difficult to install and start using it. There are many segmentation options from quite basic to more interesting ones (like guest segmentation which I discovered for myself). After you create rules it does a lot of work automatically, generates and updates customer lists. A very handy marketing tool. We also use another extension for custom attributes but initially, they were not allowed by this module. We turned to support and to our great surprise they included this feature in a recent update. This is very convenient as now segmentation is more accurate. Many thanks! This is a starting point for working with your customer base. I use this extension to define customer segments and automatically distribute new customers to relevant groups. And then use this addon to better reach target customers with emails and promos. – Fixed an issue related to conditions with an address. – Fixed an issue with installation script.